I am so excited to be participating in Plum and June's 2014 New Quilt Blogger Blog Hop this year. 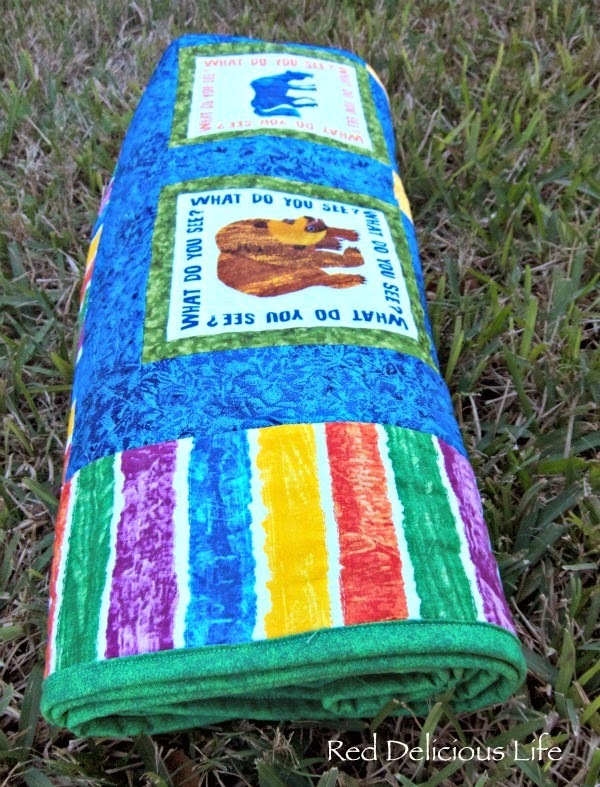 The hop will kick off this Wednesday, June 4th and there are a LOT of great new quilt bloggers participating. 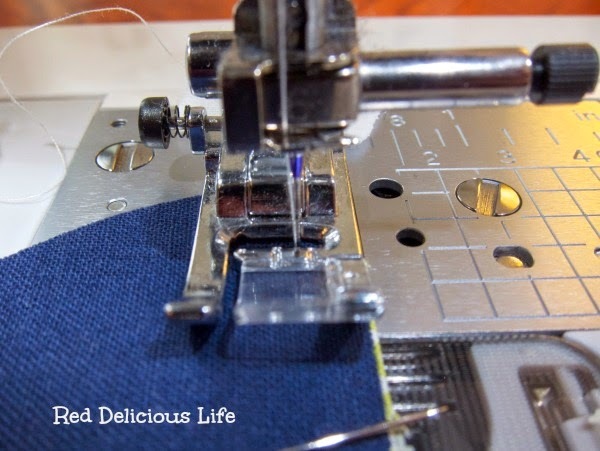 I've met so many great bloggers who share my love of fabric and quilting. 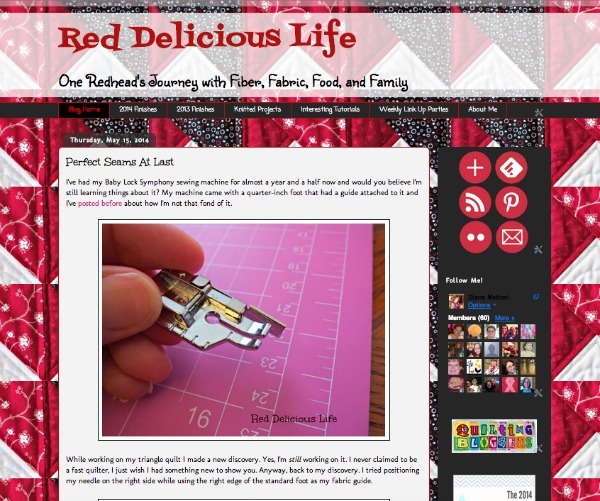 Be sure to check it out with me as I'm sure you'll find lots of quilty inspiration and some great new bloggers to follow! 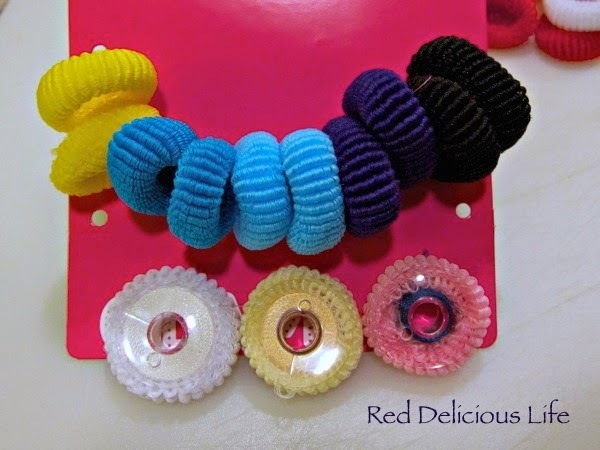 They work fine when you have a full bobbin, but are pretty useless once the thread is half used. It's been driving me nuts! Then I had a brilliant idea, or at least I thought I did until I discovered that my oh-so-original idea has been done before. Oh well, I'm still going to share it with you in case you don't know about it either. 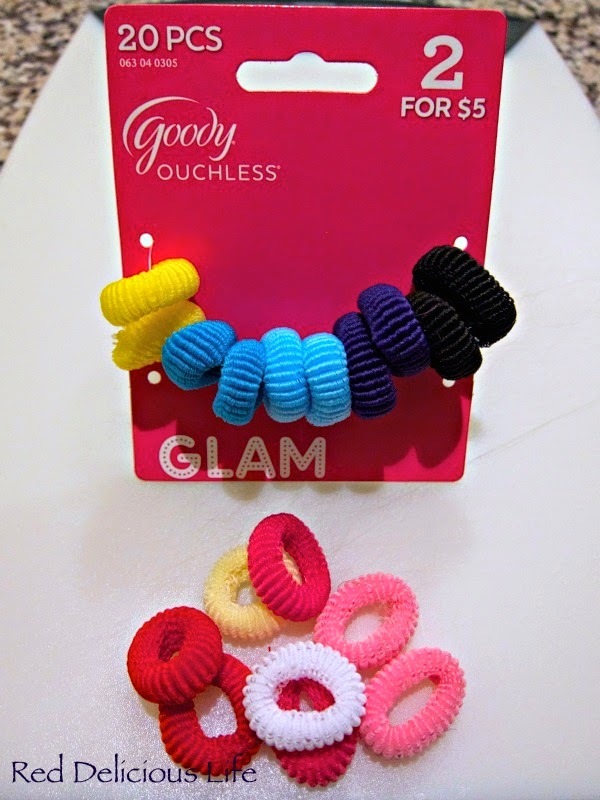 A cheap and easy way to keep your thread from unwinding, no matter how much thread you have on your bobbin - hair elastics! Now my bobbins are neat and tidy and that makes me very happy. I admit that I like order in my life and that I'm a little OCD (excuse me while I wait a moment for those who know me well to stop laughing hysterically in a corner). Yes, I like all of my spices to be in the same type of glass jars, for my socks and shirts to be folded a specific way, and to have the canned goods lining up all nice and pretty. When things get chaotic, it causes me stress. When I get stressed, I want to organize things. Just ask my husband - when he sees me pulling everything out of the pantry to reorganize, he knows that something's up. Well, my triangle quilt is causing me stress. Not enough for me to start pulling out the boxes of cereal but enough to make me stop sewing. With this quilt I've definitely learned that I'm just not a scrappy kind of girl. With 22 different fabrics in one quilt it's just too much chaos for me. I just wasn't sure what to do to fix the issue and tame down the chaos. 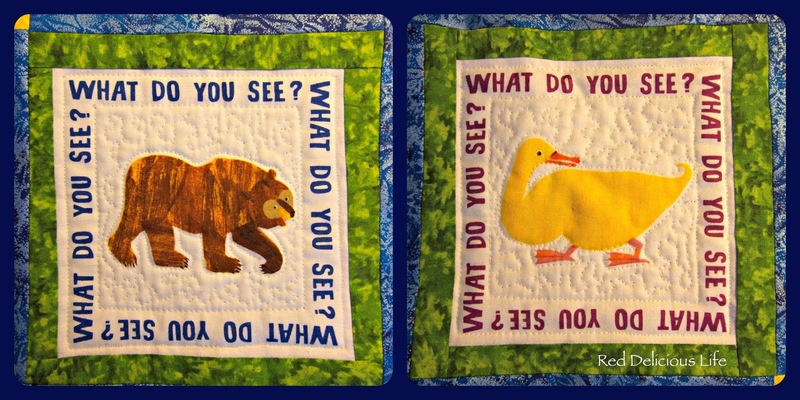 Then I saw this Blogger's Quilt Festival entry by Beth from Plum and June. Anding some solid strips in between the rows of triangles - I think that could help restore some order to my quilt! You just never know where inspiration will strike. Since I already have a stack of 2 rows already sewn together I think I'll do 2 rows of triangles with a row of solid white in between. That way I can still show off the perfect points I've already sewn AND give my quilt a new makeover, one that will feel more structured to me. Who knows, maybe I have a modern flair in me after all! I started piecing together the rows for my triangle quilt this weekend. There are 14 rows with each row consisting of 20 triangles. That's a lot of points to match up! But so far, so good. I just have to take my time. Oh how I hate that though! It's amazing how time flies. It's time again for the Blogger's Quilt Festival, hosted by Amy's Creative Side, where you can see some amazing quilty artwork. 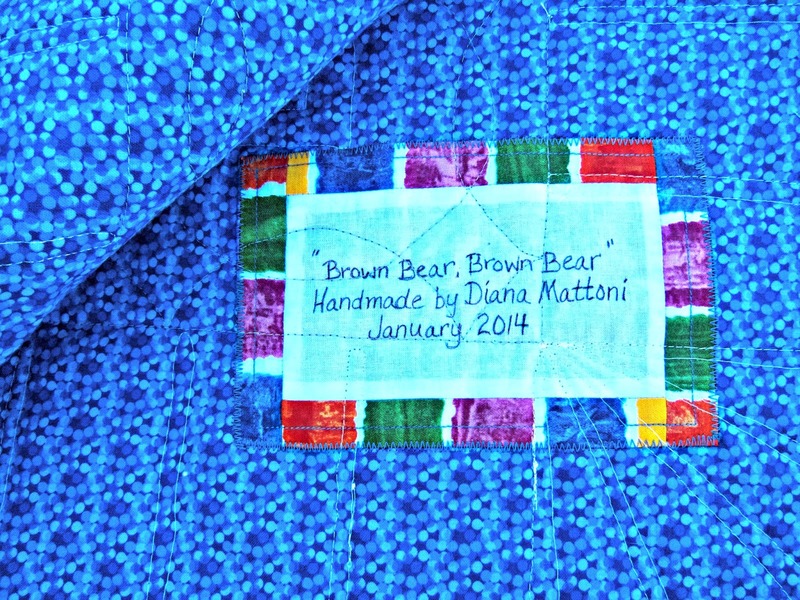 This year I've decided to enter my Brown Bear Quilt into the Small Quilts category. This quilt is near and dear to my heart and has a story behind it. It was made for my son's preschool teacher, one who specializes in early childhood developmental delays. 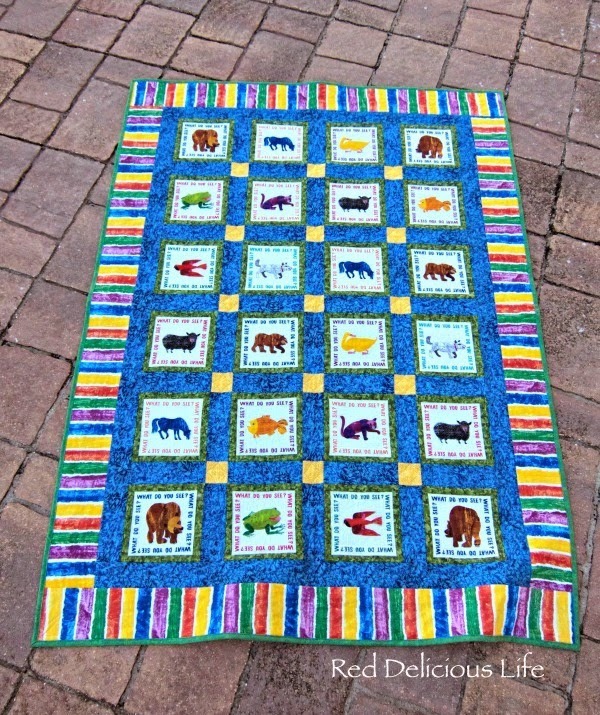 From the moment I stepped into her classroom on my son's first day I knew I wanted to make a quilt featuring Eric Carle's beloved animals. The classroom was entirely decked out in Brown Bear and Hungry Caterpillar decorations. I didn't use a pattern for this and just did a simple layout. For the individual blocks, I did some small stippling around the animals to make them pop. For the borders, I free motion quilted a scrolling pattern. Since the blue had a metallic sheen to it, marking it became challenging so I got creative and used Press'n Seal and sewed right on top of it. Worked like a charm. The quilt measures 48" x 68" and uses fabrics by Andover, Timeless Treasure, and Michael Miller. Be sure to check out all of the amazing quilts in each of the 11 categories and I hope you'll consider voting for me when the polls open in a week. This past week I've been a part of some amazing discussions associated with the 2014 New Quilt Bloggers Blog Hop hosted by Beth from Plum and June. One of the questions that she asked us was what we liked about our favorite blogs and what do we look for/what is important in a blog. I guess I never really thought about it in terms of my own blog because all of the things that I liked or wanted in a blog weren't really a part of my own blog! I liked a more simplistic design with easy-to-read fonts, larger/uniform sized pictures, white backgrounds with only a few select colors. Some things definitely needed to change so that was my focus this week. 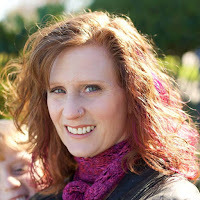 I also discovered a new blog, Sew at Home Mummy, that is hosting a 12-week Beautify Your Blog series. That couldn't have come at a better time. While I was already familiar with a lot of the things she's covered so far I did learn a few new tips/tricks. I never realized that you could backup your template. If I decided to go back to my old view I can do it with a just a click of the mouse. I also learned how to create a custom header. That's quite a difference if I do say so myself! 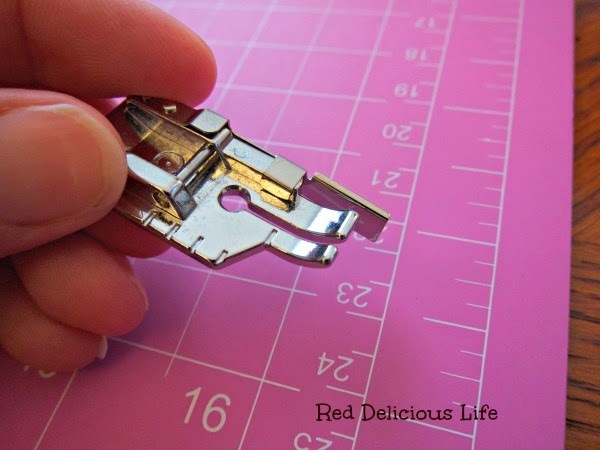 I've had my Baby Lock Symphony sewing machine for almost a year and a half now and would you believe I'm still learning things about it? My machine came with a quarter-inch foot that had a guide attached to it and I've posted before about how I'm not that fond of it. While working on my triangle quilt I made a new discovery. Yes, I'm still working on it. I never claimed to be a fast quilter, I just wish I had something new to show you. Anyway, back to my discovery. I tried positioning my needle on the right side while using the right edge of the standard foot as my fabric guide. 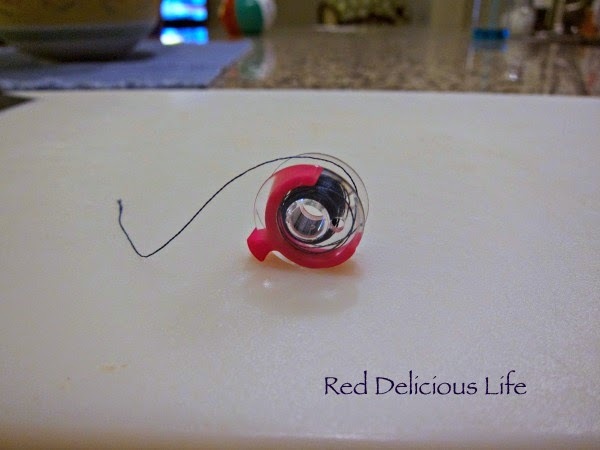 See where the center line is on the clear plastic, and how my needle is just to the right? 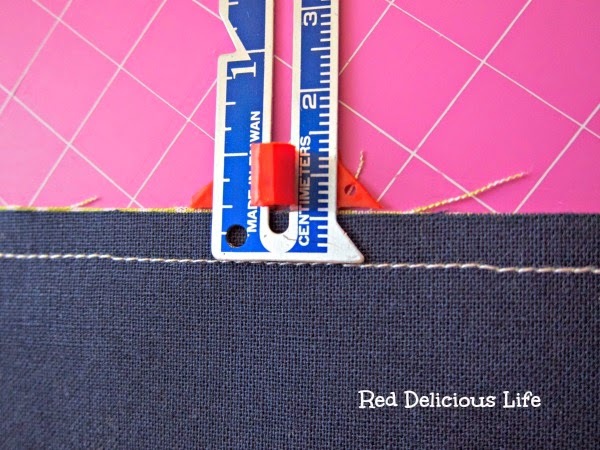 Lo and behold, with that simple adjustment I was able to consistently get a quarter-inch seam! I wish I would have figured that out a year ago! It just goes to show that I still have more to learn. First off, happy Mother's Day to all of the wonderful moms out there. 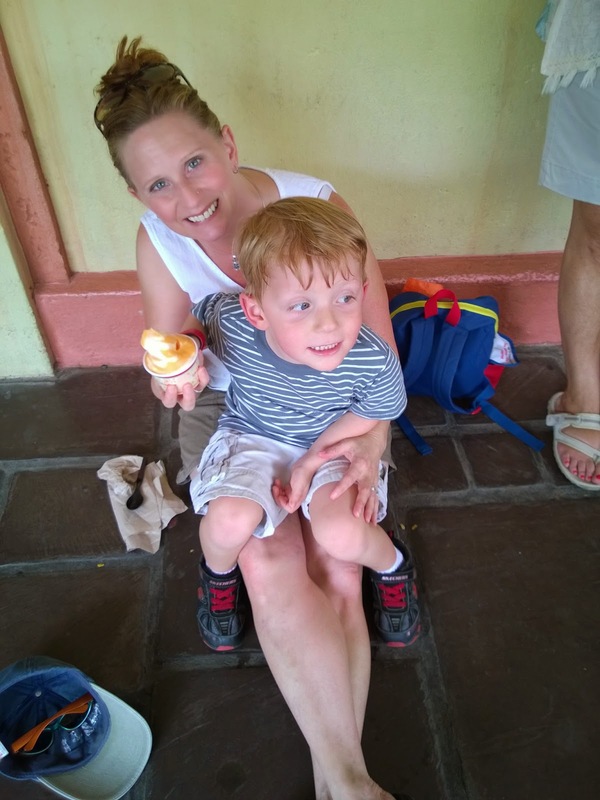 My weekend entailed a nice Mother's Day lunch at Disney's Polynesian Resort and a stroll through Magic Kingdom to get some yummy Dole Whip for dessert. This weekend also happened to be the one year anniversary of when I started this blog. I hadn't realized it until I started participating in the 2014 New Quilt Blogger Blog Hop that Beth is hosting over at Plum and June. Had I planned ahead, I might have tried to host a giveaway or something but it sort of snuck up on me. Something that I am planning is revamping the look of this blog. I want to clean it up a bit and make it easier to read so consider this warning that it will continue to look different over the next few weeks until I get everything sorted out. This week I am really hoping to get back into my sewing room. Wouldn't you know it, I finally have no deadlines and can sew at my leisure and I caught a nasty head cold that kept me out of commission all of last week. Given all of the madness lately, I never did a recap March so better late than ever I guess. 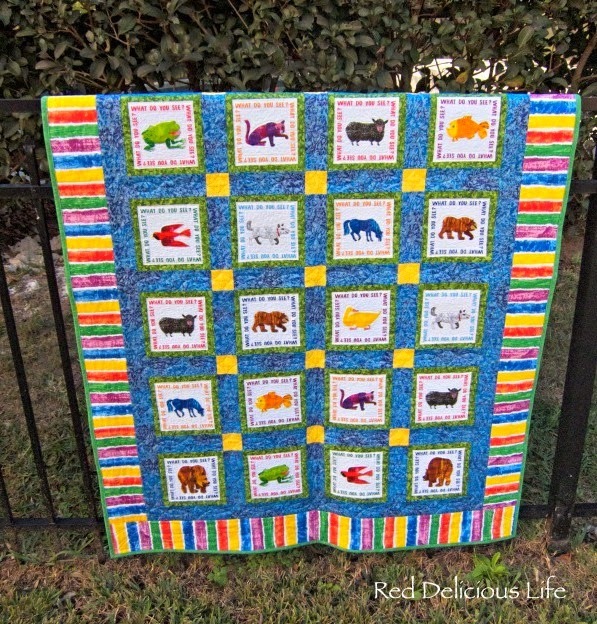 New Quilt: Brown Bear themed baby quilt for my son's preschool teacher (needs to be done in by March) --> Finished! UFO: need to finish my Accuracy Quilt --> backing is done, now I need to baste & quilt it. Software: Learn how to confidently use EQ7. I've been playing with it since it showed up a few days ago but there is definitely a learning curve. --> Nothing new on this front. Haven't even opened the software in a few months. Need to get back to this. New Quilt: A queen sized quilt for our new master bedroom, using batik fabrics. I was originally going to use the Star Surround pattern that Melissa from Happy Quilting developed for her 2013 QAL but then she posted about her 2014 QAL called Star Light Star Bright with different variations and I fell in love with variation 4! After input from her readers, the majority voted for variation #1 but I'm still going to make variation #4 (with her permission of course!) --> Have all of the fabrics purchased (finally!). Now I just need to start it. New Project: A Christmas tree skirt for next year, based on my earlier post here. --> This project is pieced together and quilting has started. New Quilt: A large lap quilt with all the half square triangles I made back in October. I still have another charm pack to make so depending upon what layout I select, it might be bigger! --> Discovered that 10 blocks were pieced backwards but these have all been fixed. It's sitting up on the design wall, waiting for sashing and cornerstones. New Project: 2014 Sewalong: log cabin mini blocks project --> finished. 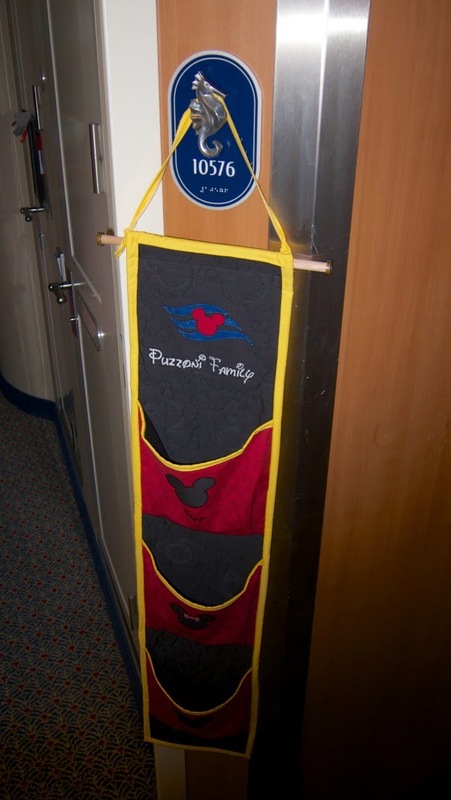 New Project: A fish extender for our upcoming cruise on the Disney Dream. --> finished. 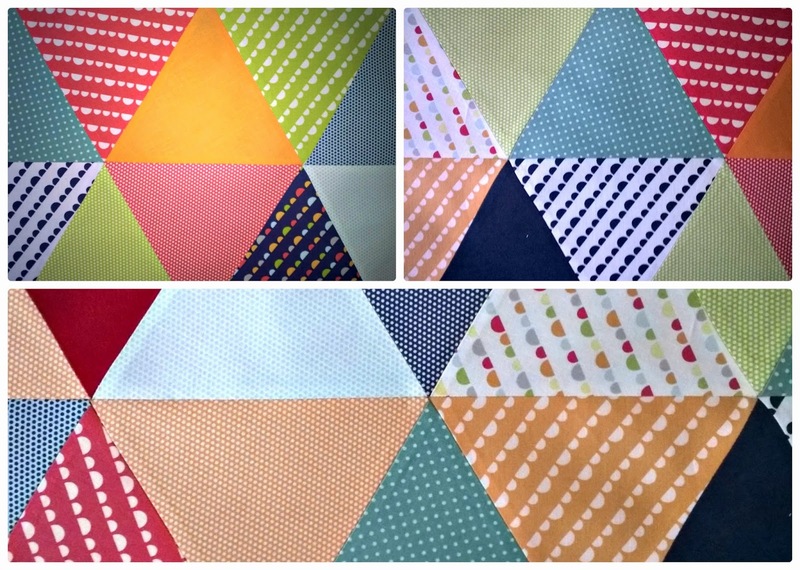 New Project: Triangle Quilt --> despite all of the chaos I decided to participate in The Sassy Quilter's Triangle QAL. I got several rows pieced together (see here) but want to make 5 additional rows and then I'll be able to piece the entire top together. Finding the time to get all the things that I want to do has been increasingly difficult over the last month. With new house stuff like organizing, coordinating with the builder to fix various issues, school stuff and therapies, my sewing and crafting time has been very limited. Not to mention getting on the computer for blogging and leisure surfing. Throw in 2 mini vacations - one on the Disney Dream, complete with crafty gifts and having my sewing machine in the repair shop for its annual tune-up, and I'm lucky I survived! I've given up on catching up on all of the blogs I read. I had to just purge the entire list and start over. Hopefully I didn't miss out on too much. The least I can do is catch you up on a few of my adventures. 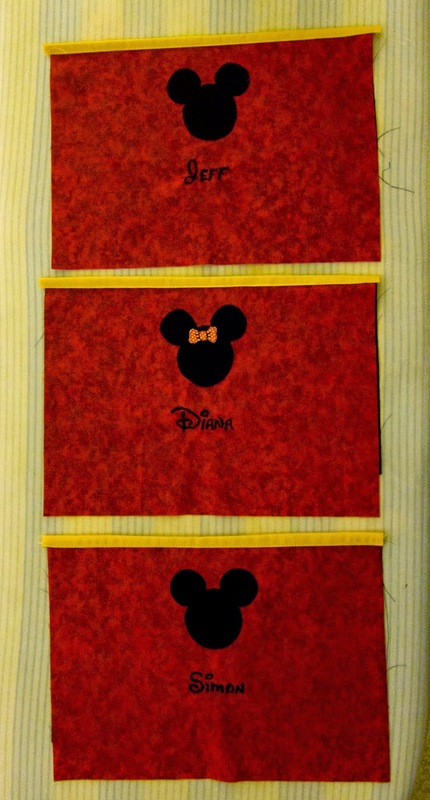 First up is my fish extender that I made for our Disney cruise. I kept the concept simple but had a few challenges. The first being my choice of fabric. I went the cheap route and used broadcloth instead of quilting cotton. That was my first mistake. I'd never worked with it before and should have tested a bit of it before jumping into a project. It frayed a lot and when it came to doing a tight satin stitch on top of it, it tended to get caught in the feed dogs. The other challenge that I had was recreating the Walt Disney font and the cruise line logo. I have a Baby Lock Symphony machine. 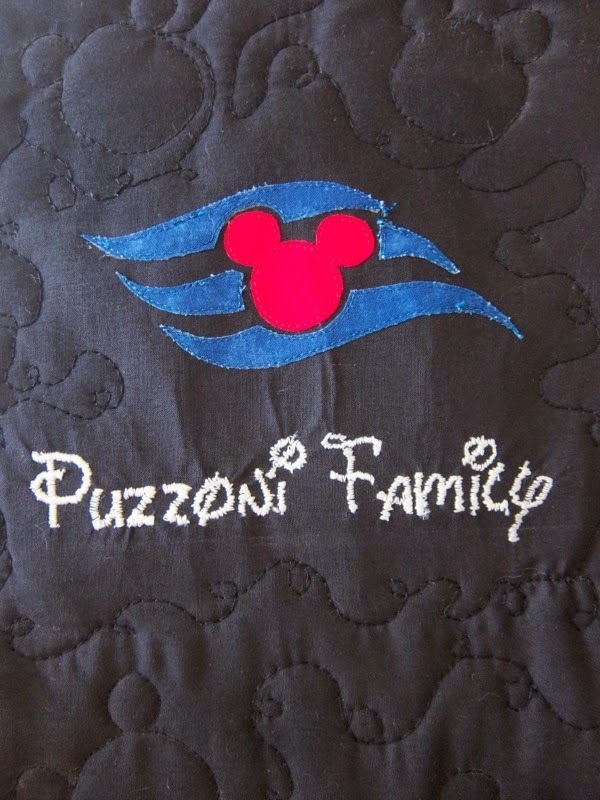 It's a quilting machine but not an embroidery machine so I did everything the old fashioned way using zigzag for the lettering and applique for the cruise line logo and the Mickey/Minnie silhouettes. I wish my cruise logo turned out better. I hadn't realized that 2 sheets of my fusible webbing stuck together until I went to fuse those tiny waves onto black fabric. It looks a bit messy close up but I wasn't about to start over so it is what it is. As I'd mentioned in an earlier post, I made a bunch of coasters as gifts for those participating in the gift exchange but there ended up being some late additions. I didn't have enough time to make more coasters since they take 3 weeks to fully dry and cure so I decided to whip together some luggage handle covers. 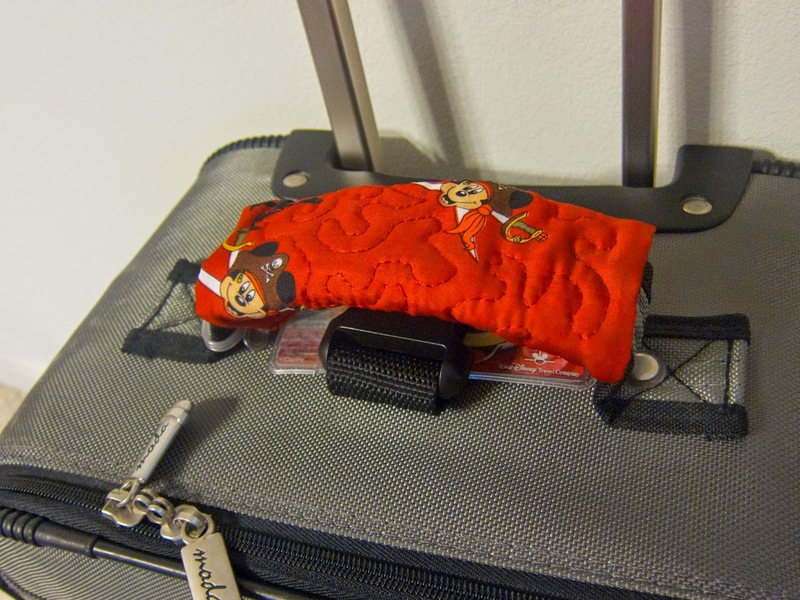 You place them on your luggage to make it easier to find on the baggage carousel in the sea of black suitcases. They're a great use of scraps and come together quickly. Even quicker if you don't bother quilting them first. 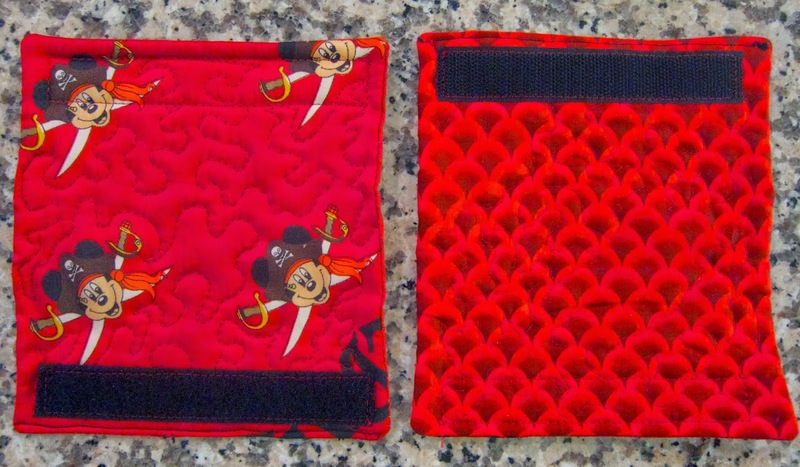 This one was made using a pirate bandana that I got from a previous Disney cruise. That's about all at the moment. Now that I'm done with all the cruise craftiness I can get back to my other WIPs and start some new projects. So happy to not have any more deadlines for a while.